Kenya Moore has been dealing with a lot of crazy rumors since she announced her pregnancy on the Real Housewives of Atlanta reunion earlier this year. Many have accused her of lying about the pregnancy, faking her baby bump and more. 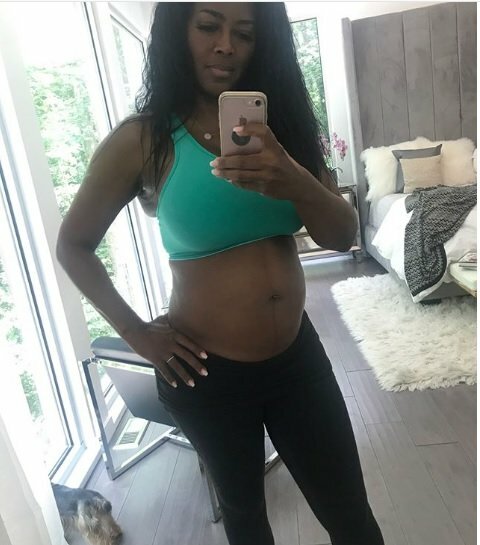 But, Kenya took to Instagram today to show off her bare baby belly and to give an update on her baby. Kenya continued, sharing that the baby is doing really well. “So far all the tests and ultrasounds say baby is healthy! Thank God. Please continue to pray for our family! #miraclebaby #weloveyou #itsnevertoolate #GodsSpeed #ThatsMrsDalyToYou #babybump #ThankYouJehovah #IVF” Do you think her photo evidence will quiet the negative comments about her faking the pregnancy with a rubber baby belly? TELL US – WILL YOU MISS KENYA MOORE ON RHOA IF THE RUMORS ARE TRUE? DO YOU BELIEVE HER PREGNANCY NOW?